I'm back from BEA and I think I've sufficiently recovered enough to dive back into work and blogging! If you've never been, all I can say is that it is a whirlwind of people and books and flyers and information and aching feet. But also fun. There IS fun in there, too! Especially with the YA community--they're all fabulous! 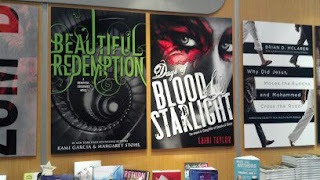 I flew out Sunday with Erika from Moonlight Book Reviews, a fellow Michigan blogger. 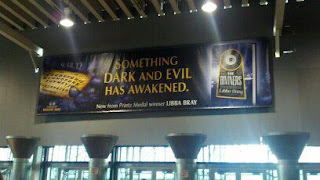 We stayed in Manhattan with Melissa Buell, author of The Seventh Blessing. 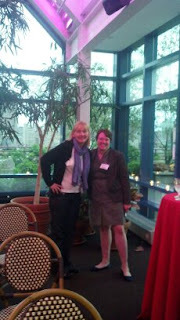 Simon and Schuster kicked off BEA week with a lovely party Sunday evening at Hudson Terrace. The party space was awesome, and they had rockstar authors Jenny Han and Siobhan Vivian (Burn for Burn), Lenore Appelhans (she wrote Level 2, yay for book bloggers! 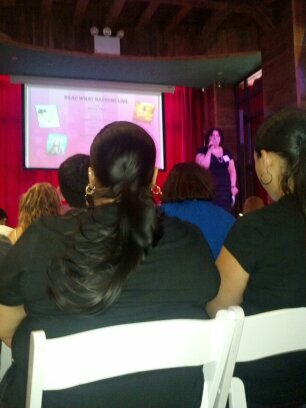 ), Shannon Messenger (Let the Sky Fall), Carmen Rodrigues (34 Pieces of You), and Tonya Hurley (Blessed) in attendance. Jenny interviewed everyone about their books and writing, which was entertaining and hilarious, and we just had a lovely time! Here's Lucille Rettino of Simon and Schuster introducing Jenny Han! She's fantastic! There were framed posters of the featured books hanging behind the bar! It was a really cool way of personalizing the space and setting the mood for the party! 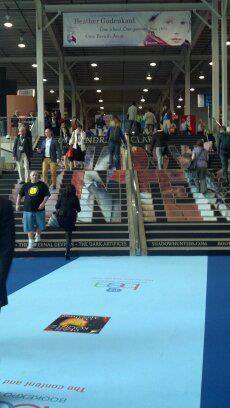 Monday was the Book Blogger's Convention at the Javits Center. It's always cool to see so many book bloggers in one place who are passionate about books and blogging, and to be able to put faces to so many blog names and Twitter handles. 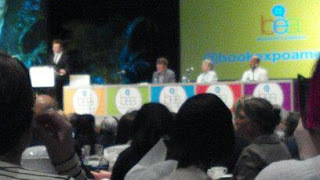 Jennifer Weiner was the keynote, and she was very funny and entertaining. 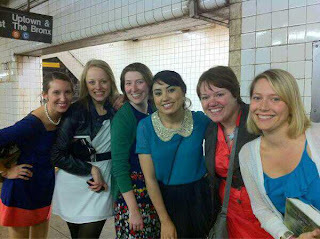 That evening was a party at the Scholastic offices. I've said it before, and I'll reiterate it now, but that building is the coolest. It's bright and fun, and they have a lovely terrace on the very top where the party was held. We mingled with the lovely Scholastic staff and other bloggers, and then we had author performances! Jeff Hirsch, Raina Telgemeier, Kate Messner, and Donna Cooner were up first, and together they read from each other's books. 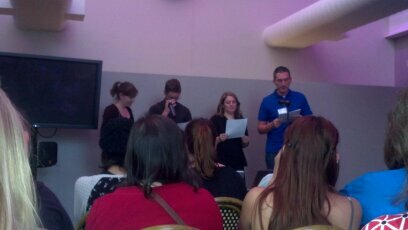 Then we had James Dashner (who is unbelievably funny and entertaining), Maggie Stiefvater, Sharon Cameron, and Eliot Schrefer up for their own dramatic readings--it was so funny! They worked so well together and it really was a one-of-a-kind performance! Raina, Jeff, Kate, and Donna! 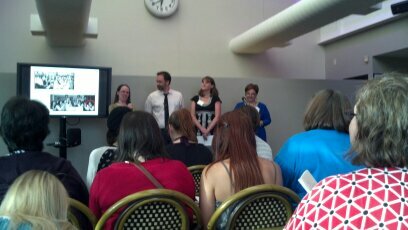 Here's Maggie, Eliot, Sharon, and James! Melissa and I! It's kinda hard to see, but this building has an amazing view! Tuesday marked the first day of BEA at Javits, and it was a little hectic, but so much fun seeing the authors, publicists, and other bloggers, librarians, and booksellers. 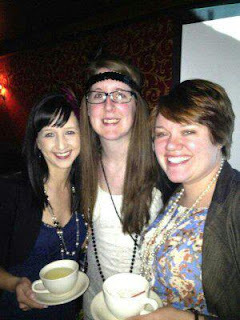 Tuesday night was the speakeasy party that Little, Brown put on for Libba Bray to celebrate her new book, The Diviners, which is set in the 1920's! it was an awesome, awesome event and very authentic, from the space it was held in to the coffee cups and mugs that the drinks were served in! Here's Tara Quigley of Fiction Folio, Shanyn Day of Chick Loves Lit, and me! 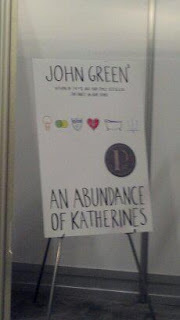 Wednesday night was a party for the Katherine Tegen imprint of HarperCollins! 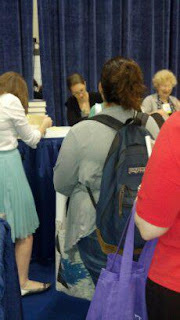 It was a fun time--I saw a lot of my fellow bloggers, saw MI writer Courtney Allison Moulton, met some awesome KT books editors and publicists, talked to Sarah Tregay's husband, and then Sarah Tregay herself. We had a lovely time! Check out the cool banner for Libba Bray's new book, The Diviners! 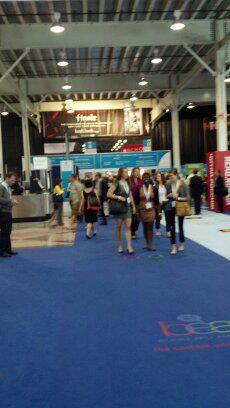 The entrance to the exhibit hall, with a banner for Becca Fitzpatrick's Finale in the background! Sourcebooks' new Authors Are My Rock Stars tee has Edgar Allan Poe rocking an awesome pair of shades! Want one for yourself? 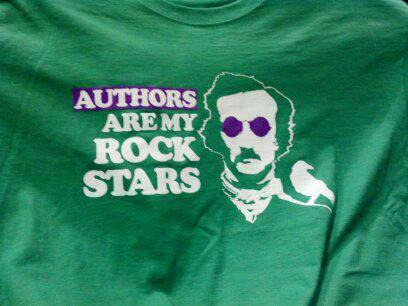 You can get this tee on the Sourcebooks website. They're $20, but that includes shipping! 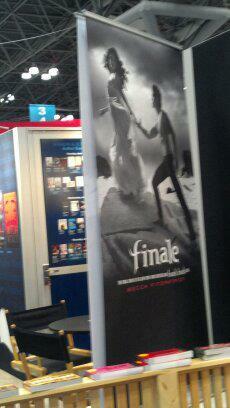 The Little, Brown booth had some awesome posters of upcoming books! I LOVE the Days of Blood and Starlight cover! I am so excited to read it--Daughter of Smoke and Bone was one of my favorite books of 2011! The stairs at Javits! It's hard to see, but they say Shadow Hunter! Yay for Cassie Clare! ﻿It was a fun and exhausting week, and every book I came home with I'm really excited about! I can't wait to tell you guys more as I read them! HA! You took a picture of me at the scholastic event! I am right next to the girl with the red shirt, to her right. Sad that we couldn't say hi! It looks like you had a great time! Awesome pictures and narrative!!! Great pics! It was lovely meeting you in line... though of course, I have zero memory of what the line was for! I am happy to volunteer to carry your bags next time, if it means I could go. SO JEALOUS!! !